Siliguri: The state government plans to organise a "World Tourism Festival" in the state to showcase the potential of Bengal, state tourism minister Gautam Deb said here on Saturday. He said the initial ground work had been started and the details would be finalised after consulting chief minister Mamata Banerjee. "Bengal has a huge potential in tourism. The state has lush green forests, mountains, beaches and wildlife that every year attracts tourists from across the country. We are planning to highlight these in a planned manner throughout the year to international tourists, so that the inflow increases," Deb said. "We have already launched a couple of major tourism projects like Bengal Safari on the outskirts of Siliguri. Gazoldoba is another project that will come up with cottages, boating, hospitality training institute and budget hotels," he said. The minister was here at Dinabandhu Mancha to inaugurate a quiz programme for students organised by the state tourism department titled 'Great Bengal Quiz'. Fifty schools participated from Siliguri, Calcutta, Burdwan and Behrampur. The final will be held at Calcutta on January 13. "Our department is organising such events to spread awareness among people about their knowledge from the school level, as tourism is a vast subject and it generates more employment opportunity than IT sector," the minister said. Tour operators who were present at the event though welcomed the idea of international tourism meet, but also said that the government should focus on improving infrastructure first. 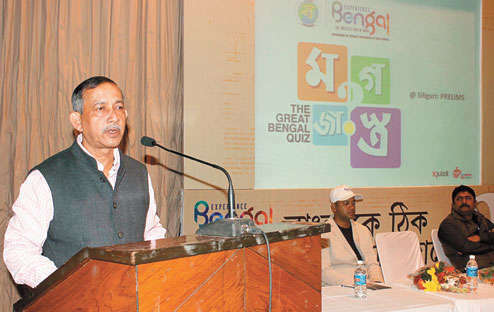 The state government plans to organise a "World Tourism Festival" in the state to showcase the potential of Bengal, state tourism minister Gautam Deb said here on Saturday.